Exploring the ins and outs of specifying and ordering a flexible specialty machine tool and having a machine builder produce it. – Devoting an individual to act as the go-to person when issues arise. To provide feedback about how to build flexibility into a specialty machine. For example, flexibility is one critical requirement for a machine Bertsche Engineering Corp. is currently building. The Buffalo Grove, Ill., company builds custom machines, primarily for the aerospace industry, as well as standard metalcutting and high-pressure water and mechanical deburring machines. That will allow the parts manufacturer to support its other production requirements by having one machine that can morph into the machine that’s needed. 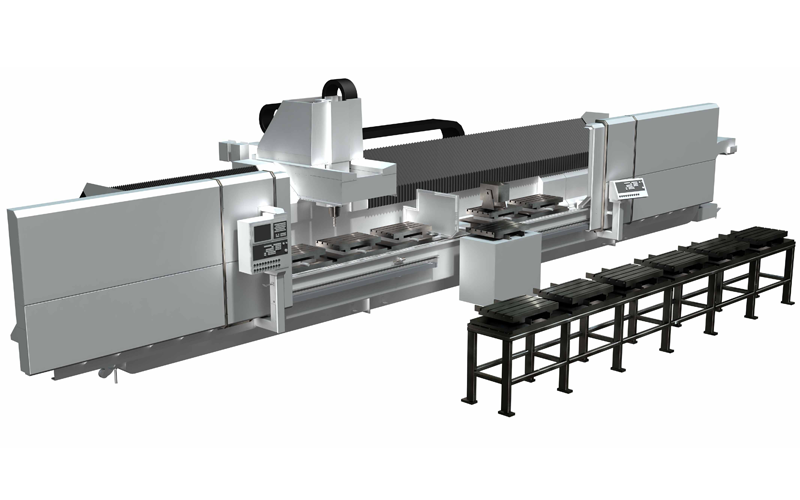 Bertsche Engineering enabled that by customizing a standard machine with reconfigurable worktables and “sophisticated” workholding devices. “We designed that functionality into the machine, and we really had to wait for a customer with a work environment and a machining need that required that functionality,” Bertsche said. Flexibility was also a central part of the custom, 2-axis internal grinding machine CNC North Inc. built for a Canadian manufacturer of aerospace landing gear. CNC North designed the grinder so the workhead and steady rest move together on a rail so the operator can set them where he wants. “We provided him all the flexibility in the world for moving his workhead and steady rest in and out,” said Patrick Harrington, company president. Although landing gear components are the customer’s primary focus, Harrington added that “he wanted flexibility to be able to bid and process additional parts.” Incorporated in 2005, the Springfield, Vt., company initially focused on supporting, remanufacturing and providing design enhancements for Bryant Grinder CNC machines, in part because CNC North’s mechanical engineers are all former Bryant engineers. However, the company expanded its capabilitieslast year from machine remanufacturing to building new grinders and the 2-axis internal grinder is its first. “We are now quoting more new and specialty machines than we are rebuilding,” Harrington noted. The new CNC machine replaced a hydraulic, manually operated grinder, but it had to fit the exact footprint of the old one because of limited floor space. That gave CNC North an advantage over other builders offering competitive bids but for already-designed grinders that, in most cases, were too large. “We were very competitive on price and lead time by doing it with a custom application,” Harrington said. has been aged for years and years and years,” Harrington said. CNC North provided custom guarding to meet Canadian regulations. After developing a 3-D model of the initial guarding design with two doors, CNC North went to the customer’s facility and met with the operators and safety and setup personnel to gather their input. As a result, CNC North reconfigured the guarding to have three doors, making setup easier. An end user also requires a specialty machine tool when the specified tolerances are tighter than what standard offerings can achieve, such as the one machine builder Mitsui Seiki (USA) Inc., Franklin Lakes, N.J., delivered to Axsys Technologies Inc., Rocky Hill, Conn., for producing the beryllium lenses for NASA’s James Webb Space Telescope. According to NASA, the JWST will be the most sensitive infrared space telescope ever built, and its mission includes peering into the universe’s farthest galaxies to see the first stars. That required a machine tool that’s been hand scraped and manually fitted and built in a temperature-controlled environment to ±0.2° C from floor to ceiling on a 1,200mm concrete foundation to eliminate vibration, according to Scott Walker, Mitsui Seiki president. “We assemble the machine, measure it, take it apart, make a correction, reassemble it, take it apart again if necessary and continue to do so until the machine comes into the tolerance that’s been sold,” Walker said. If the part is quite heavy, say 8 tons, scraping accuracy for the X-axis, for example, needs to be measured with the weight on it so the travel is straight with the weight in place, and the axis will not be straight without the weight. Allis Tool & Machine builds custom equipment such as thermal curing chambers, automated part loaders/unloaders, assembly machines and drilling and tapping machines. The Milwaukee-based company also does low-volume prototype and production machining of medium to large parts, as well as machining of the components needed for its specialty machines, such as bases, fixture plates and risers. According to Bertsche, custom machines are almost always sold to a customer-generated specification that is initially generic. “Typically, it starts out that the customer has a problem and he’s looking for a machining solution,” he said. “The first set of specifications oftentimes just describes what the customer needs to have.” The end user is often looking for a concept that allows him to better define his requirements before a specification is created that then goes out for bid, Bertsche noted. The specification gets refined based on feedback from builders before being submitted for final bidding. The winning bidder then develops a working system based on the proposed concept. “Once you’ve been awarded an order, there’s a number of design reviews required,” Bertsche said. “As you get to some of those decision points, certain elements have to be jointly decided between the customer and builder.” For larger companies, such as a Fortune 500 OEM, one area in the design process that isn’t jointly decided is certain critical purchased components. Those are quoted to a plant standard or specification, usually from a maintenance perspective, so an adequate supply of spare parts is available in inventory, Bertsche noted. Walker noted that every end user/builder relationship involves give-and take, and the machine for the telescope project was no exception. The machine’s Y-axis travel straightness had to be extremely accurate because the lenses were 1.5m in diameter and have machined features on the top and bottom, and pallet wobble had to be kept to an absolute minimum because the front and back faces of each lens required machining. “And they let go of some of the tolerance criteria in the X-axis and Z-axis to accomplish that,” Walker said. Mitsui Seiki sold eight machines for the JWST project and 18 lenses were required to make the telescope’s aperture. Each workpiece weighs about 700 lbs. and ends up as a 25-lb. lens after 6,600 hours of machining time. “Typically, these kinds of machines are designed for 75,000 hours of operational use,” Walker said, “and 75,000 hours is three shifts a day, 7 days a week for 12 years. That’s your straight depreciation schedule so you can fully depreciate the machine over the life of its application.” That means after producing the lenses, plenty of machine life remained. “They’re making other types of components but the customer who purchased them is still using the machines,” Walker noted, meaning even application-specific specials offer flexibility. When an OEM requires ultraprecise application-specific machines for producing its core-competency products, the machine builder is bound by proprietary agreements to not release any information or provide similar designs to other customers. In return, the OEM gives the builder access to its R&D, engineering and product design personnel. That can be beneficial when developing a production-ready solution for a machining challenge, such as providing a specific spindle stiffness characteristic from one machine to another. Both parties might dedicate an engineer to provide technical assistance to each other during the customization process, which Klein Tools Inc., Skokie, Ill., did when it also purchased a specialty Kitamura machine from MTT-21. “The lines of communication were always open and there was always a go-to person available so any questions that came up from either us or from them were cleared up rather quickly,” said Mike Baker, manufacturing manager for Klein Tools.